Guardiola’s Plan D (or F?) worked, but BVB kept up and showed that they’re still one of the five best teams in Europe. Munich were able to put the spotlight on themselves not only with the victory but their tactical adaptation. The successful Catalan played a back three in defense earlier this year. In the preseason game against Red Bull Salzburg the back three failed all the way across the line and led Bayern to defeat; the analysis of that game can be found here. They pulled it out of the archive for the DFB Cup final and played with a similar orientation. Again, the formation was a 3-4-2-1 with the wing backs playing more passively on offense. In the game against Salzburg it was more of a 3-2-2-3, with Gotze and Thiago as the creators in the intermediate line space and thus playing as midfielders. The distribution of roles was different against Dortmund. Rafinha played passively on the left and cared primarily about a simple ball circulation and supporting the defense and the midfield. Hoejbjerg was a bit more active, higher, and goal oriented in his passes, but the primary difference between the two was their positioning. The Brazilian played a little deeper and was more hesitant about moving up. Occasionally there was a brief back four, where Hoejbjerg was slightly higher and Rafinha played on a line with the three defenders; Boateng was then situationally more to the side than Dante. All in all, it was clearly a Dreierkette (literally triple chain, i.e. back three), with the wing backs comparatively restrained and limited to providing width. Later in the game they got involved in the final third – in some cases even after indenting movements into the half-space, which didn’t happen in the first half. The focus in the build-up play was on the center and the half-spaces. Anyone who has read the latest edition of our magazine, Ballnah, will recognize not only a tactical but a strategic change in Bayern’s game. The focus was more on the build-up game and creating attacks centrally. Philipp Lahm formed the “Double Six” with Toni Kroos and Thomas Müller, Mario Götze, and Arjen Robben at the forefront comprising an extremely powerful and compact group. In addition, Götze was – after Franck Ribéry replaced Lahm – always dropping back to support. Müller filled the situationally open spaces and Robben shuttled along the opposing defenses to search for spaces horizontally, which Müller opened a few times by dynamically falling back to the right. This setup enabled some interesting attack and build-up structures. Via the back three they were to able to outnumber Dortmund and safely circulate the ball. Dante and Boateng, at the half-back positions, lured the front row of the opponent’s pressing wide. This allowed them to have their very long clearances and sharp flat vertical passes. In critical situations they could strike either option into open spaces or play passes to nearby teammates. These passes could come back to the central defenders, to Manuel Neuer, diagonally to the flanks, or even into the six space; which was beneficial to the field of view of the sixes and helped against the pressing structures of BVB. There were also some interesting interactions with Manuel Neuer. When Neuer was incorporated into the build-up game, the defenders let themselves fall back because of his deep position. This created either an asymmetric goalkeeper chain (Martinez falling back to the side, one of the half-backs fan out to the full-back position) or Martinez moved up into the midfield band and created an overload, or acted as a breakwater, against Dortmund’s pressing movements in a flat, wide diamond – often a quasi-4-1-4-2-formation. This drawing out of BVB also allowed long, expansive balls straight forward. The local narrowness of the two to three strikers took care of any possible combinations and short-lived Gleichzahlsituationen (even numbers, no overloads). Robben was always moving in search of a pass in the resulting hole in Dortmund’s defensive network. The proximity of the three strikers also provided for quick and easy position changes and take-overs. The advantages of the 3-4-2-1 weren’t only on offense. Defensively, they could switch to a 3-4-1-2 press, with five at the back. The two strikers adjusted to the Dortmund central defenders and the third striker blocked the six space. This led to BVB beginning their build-up on the wing, where the wing back immediately had access; there was a shuttling back four behind him for protection, the two sixes and a situational ten secured the central space and the strikers handled the central defenders. Bayern played with many tiny man markings; in a moment from the beginning of the game, with Reus falling back into the first third, Lahm briefly played as a ten against the ball, with Müller completing the double six with Kroos. 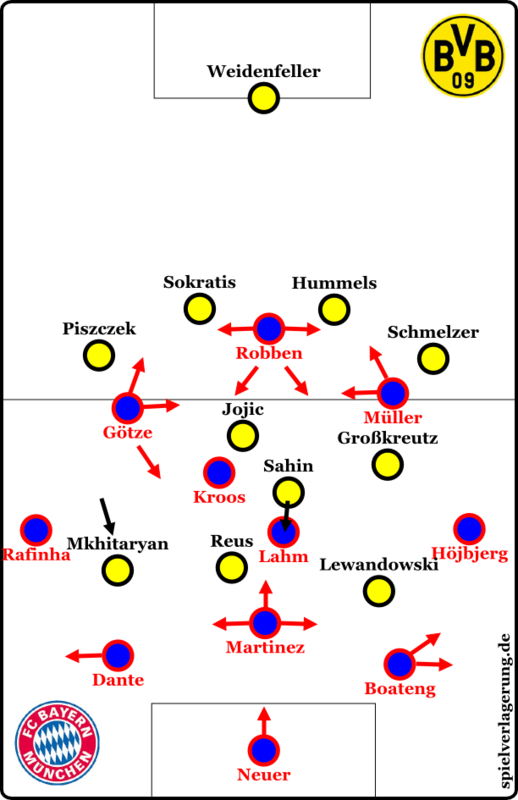 If the Dortmund came forward into the half-spaces (or center), Müller – or Gotze as seen in the graphic below – fell back as tens (mostly away from the ball) and secured the shifting of the double six. A 3-5-2 staggering also emerged with a clear five-man midfield. Against the central attack play and combinations of BVB, Bayern basically had a double six and because of this 3-4-2-1/5-2-3 formation, in the 5-3-2 roles, the three central defenders could leave their positions to press and have continuous protection. In their own ball circulation they could push flexibly into the defensive half-spaces, and after a few lost balls in defensive Umschaltsituationen (switches from offense to defense) they were able to prevent an early counter or divert play to the wings. BVB had certain problems with this. Caveat: We will only devote a small paragraph to Dortmund’s play. This is not about any personal preference, but simply that we have already discussed the new system of the schwarzgelberseveral times and even written a system analysis. Meanwhile, Munich’s system is relatively new. On to Borussia. Once more they pressed into their variable and asymmetric 4-2-3-1, which morphed to a 4-1-3-2, a 4-1-4-1, a 4-3-3, or even a 4-2-4. Against Munich’s new system, the 4-3-3, which was also designed asymmetrically, worked the best. Mkhitaryan moved up to the front and supported Reus and Lewandowski, while Mkhitaryan’s counterpart, Kevin Grosskreutz, mostly stayed deeper. However, this was not a clearly shifted 4-3-3 as in league play , but a kind of 4-2-1-3. 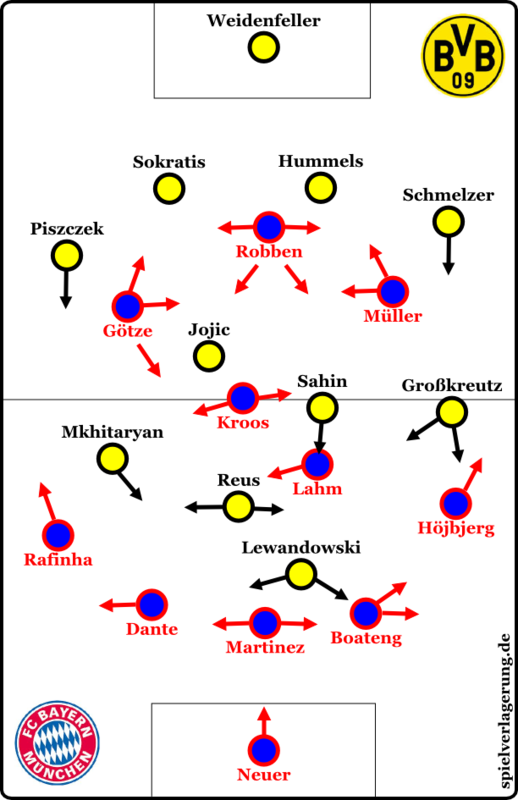 Mkhitaryan often stood on a level with Reus and Lewandowski to deliver the pass routes of three defenders, while Sahin tracked the paths of Lahm and sought to take him out of the game as a man-marker. Jojic secured the middle and Grosskreutz played on his side mostly on his height, but remained on the wing or in the half-space. This basically created similar problems for Munich as they faced in the league. The passive attack pressing of the Dortmund 4-3-3 set their pass routes and pinned them firmly in their own half. In contrast to the league, however, Bayern was set up much better. They had a player on the defensive, in a sense, two fewer players on the wing and better occupied the open spaces of the Dortmund formation in midfield. Via the three central defenders, Neuer could play these spaces better and come further forward. When Bayern made it past the first pressing row, BVB looked unstable. Because of their fast falling back after these passes they could choke off Bayern’s attacks with their defensive retreat, making them too quick or forcing them back. The champions rarely came by resounding chances despite their superiority on the ball and ultimately the shot ratio was balanced. While Bayern were slightly better, BVB also had potential game-deciding chances. This was especially true after the changes. There weren’t many big changes in this game, just some smaller ones. First, Guardiola brought Ribery on for Lahm at 31 minutes for Ribery and pulled Götze backwards, who then acted on a line with Kroos. Kroos took over Lahm’s role as the primary passing option for the defense, while Götze played a little more vertical and higher. After an hour, Jürgen Klopp responded. Kirch for Mkhitaryan meant Jojic went to the wing and there was a more stable central cast of Kirch and Sahin. Furthermore, the 4-3-3 was still clear and moved well in the formative holes of Bayern’s pressing in the half space. The substitute Pierre-Emerick Aubameyang came on for Jojic and occupied the extreme right position and wanted to offer more on the counterattack. Hofmann for Grosskreutz was an even more proactive choice in extra time. For Bayern, the occupation of the wings and the front moves in the game changed slightly. The wing backs moved further forward and situationally they even moved towards the middle. The forward group’s rochierten (literally, castling), or swapping, also changed. In some cases they dropped more sharply – especially Ribéry, in phases. Later on there were clearer wing occupations, where in some cases a 3-4-3 was played with Ribery and Robben briefly occupying the sides. There were also personnel changes. In extra time, Daniel van Buyten came on for Hoejbjerg, and Boateng moved up to the wing back position. Pizarro came on for the injured Ribery and played as a center forward. Tactically, it was a great game, but the playing couldn’t always keep up with the tactics. That being said it was a great show with a lot of tension. BVB competed very well and had their moments, but Bayern was slightly better and the back three neutralized the previous inferiority in the league clash. Bayern’s formation was difficult to describe. It was somewhere between a 3-4-2-1, a striker-less system, a 5-3-2 with a varying third midfielder – Götze as a deep left ten or Müller as a right vertical eight – or even a situational diamond with a slightly later indenting wing back or a 3-3-1-3. The Dynamik in the attacks was much higher, as was the counter game. Bayern wasn’t revolutionary, but what they did was simply intelligent and unfamiliar in German football. Munich finish the season on a high note, BVB is probably at odds with the referee; I hope that our readers will not dwell on this.